In 1972, inspired by Bucky Fuller and under the guidance of EcoSystems and the professional assistance of Central Coating Company, a group of students built their own homes at UC Davis. Once a visiting African student said that Baggins End was more like a village than any other place he had been in the USA. 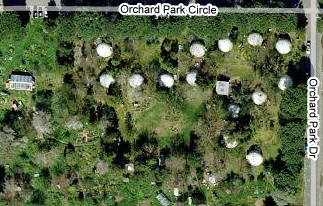 The domes were to be paid off by 1980 (in 8 years), and it was unclear whether they would be preserved after the loan was amortized. Well, they are still standing! The "Domies" had their 30th reunion in June 2002 and their 25th reunion in September 1997. A the 25th we even had some belly dancers on hand to help us celebrate! We started out with a contract to do a few sketches for the UC Davis housing office in 1971... ... and based on those sketches we got a contract to build a house in the Santa Cruz mountains, where we prototyped our construction methods. ... We were under construction in '72. ... We had a bunch of happy campers at our 10th reunion in '82! ... At our 20th reunion in 1992, we had a ceremony dedicating Baggins End as an historic landmark! ... and today, Baggins End is still on the map! Now you can fly first class to Baggins End on Google Maps in no time. Learn about the Bike Church which is located at Baggins End.